Duck hunting dogs belong to a wide group referred to as AKC’s Group One, the group of Sporting Dogs, also referred to as the waterfowl hunting dogs. It is from this group the dogs have developed and gained their reputation. Today duck hunting is considered to be an outdoor sporting activity, and the duck hunting dogs are now part of a huge world of hunting, where commercial waterfowl hunting is not as popular as in the past. But for those who do hunt for a variety of other reasons, the water dogs or waterfowl hunting dogs can spot and remember perfectly the exact location of the downed bird. Waterfowl hunting is an outdoor sporting activity enjoyed by people all over the world. Many hunters use upland game dogs to retrieve their downed ducks. Duck hunting dogs not only retrieve dead ducks from cold water and difficult terrain, where a hunter could possible be injured but they also search for and recover wounded ducks. These wounded ducks could escape or die a slow, painful death. Because of their keen sense of smell, well-trained hunting dogs usually have no problem finding and retrieving ducks shot by the hunter. Small game hunters using shotguns normally have gun dogs or duck hunting dogs, which primarily hunt waterfowl and small game. The three classes of gun dogs are pointing breeds, flushing spaniels, and retrievers, which are all good waterfowl hunting dogs. They train pointers to locate their prey and stand motionless, pointing at the bird or small game. These dogs point or freeze to keep from flushing the game until the hunter gets into position. Most pointing dogs will retrieve downed birds. Pointers are loyal, affectionate dogs that make wonderful pets and love to hunt. 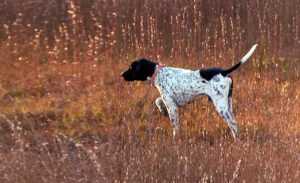 English pointers, German shorthair pointers, Irish setters, English setters and German wirehaired pointers are great waterfowl hunting dogs. Flushing spaniels or flushing dogs are dogs that hunters have used for several hundred years. Hunters train them to stay close, usually within thirty-five or forty yards. Flushing spaniels work close, so the hunter gets great shots at the fast flying ducks the dog flushes out. English Springer spaniels are great flushing dogs and make a great house dog. These dogs are loyal, compassionate, and extremely intelligent, with natural hunting abilities. English springer spaniel flushing dogs work hard, are good tempered and love hunting. Retrievers are duck hunting dogs that recover the ducks or other waterfowl without damage to the game, because of their soft mouths. They are quick to learn, easy to train, enjoy hunting, and love to please. A well-trained retriever can mark, follow hand signals, retrieve to hand and knows many more commands. The hunter commands his or her retriever to mark and the dog looks up for a falling bird. There are times when it is necessary for a retriever to follow hand signals. Hunters must be able to direct their dogs remotely, in some situations, so hand signals are extremely important. The retrieve to hand command is where a retriever puts the waterfowl directly into the hunters hand. Great duck hunting dogs are worth their weight in gold to a hunter. Birds such as ducks and geese are part of the same habitat, and have the same hunting seasons or at least they will overlap while using the same hunting methods. In the early days, waterfowl was hunted for food, their down and feathers. Today, considered more of a sporting event, the bird dog or the duck hunting dogs consist of breeds such as the Clumber spaniels, American cocker spaniel, English Springer spaniels, German Wirehairs, Irish Water Spaniels, and Nova Scotia Duck Trollers. It is no accident that the duck hunting dogs eventually became located in the United States in the early settler days, as the Europeans and early settlers brought hunting dogs with them when with they first came over to North America. The most prominent early imported dogs were the imported Mountain Curs and the American coonhounds, with early diaries of Hernando de Soto having the first written word of the hounds in America. This diary said their hunting dogs were not used for hunting gamebirds or small game, but used for hunting Indians, unfortunately. In the late 1800s, bird dogs became the thing for “sporting gentlemen” with the quail hunting preserves developing, and then onto more duck hunting dogs and small game bird hunting dogs, in a variety of events. Titles, contests, and money became the thing to do by highly bred gentlemen with highly bred dogs that were trained to win by the best. It was at this time that events brought in breeds such as the duck hunting dogs to take part in the first annual National Championship Field Trial in Massachusetts, sponsored by Hobart Ames. Eventually, this became a 25,000-acre reserve by the country. Today, bird dog clubs hold annual events that eventually lead into the national contest, with the duck hunting dogs participating. This area near Grand Junction is the home of the original National Bird Dog Museum honoring 40 breeds of those first hunting days.